In terms of country music friendships, Trace Adkins and Blake Shelton‘s is one of the longest-lasting and strongest. Speaking to FOX News in 2015, Shelton explained how Adkins became his mentor and helped him through the earlier years of his career. Years after Shelton hit it big, he brought Adkins on as a featured vocalist on a rowdy track titled “Hillbilly Bone.” The song was a smash hit, as it reached the top spot on the Billboard Hot Country Songs chart and the 40th spot on the Billboard Hot 100. To this day, Shelton and Adkins will surprise each other’s fans by showing up to their concerts for surprise duets on the song. 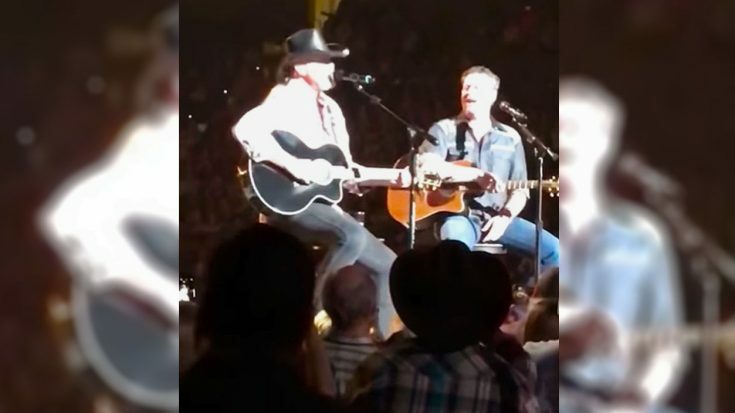 Since the fans always seem to enjoy watching them together, Shelton thought it made perfect sense to bring Adkins along this year on his Country Music Freaks tour. In addition to touring with Shelton, Adkins is serving as his team advisor on The Voice this season. But even though the two have been spending even more time together lately than usual, Shelton is still just as mesmerized by Adkins as he was years ago. One fan-captured clip proves just how much admiration Shelton holds for his friend and mentor. The clip shows Adkins and Shelton seated next to one another on stage, each with a guitar in hand. Suddenly, Adkins begins singing his emotional hit “You’re Gonna Miss This,” and Shelton’s reaction was everything. As soon as Adkins started singing, Shelton began clapping, and it was impossible for him to hide the grin on his face. It’s clear that he was overjoyed to hear Adkins sing “You’re Gonna Miss This,” and he couldn’t help but sing along as well. Even though he wasn’t singing right into the microphone, you could see that Shelton was still singing loud and proud at Adkins’ side. Shelton’s excitement over Adkins’ performance somehow made the song even more emotional than it already is. It was quite touching to see such a genuine reaction from Shelton…goes to show just how much respect he has for Adkins. Go ahead and tune in to the clip below to watch Shelton’s completely spontaneous reaction to Adkins singing “You’re Gonna Miss This.” This is one of those special once-in-a-lifetime moments that no one will forget!